I'm really lucky that there are so many friendly and helpful bloggers in Glasgow! 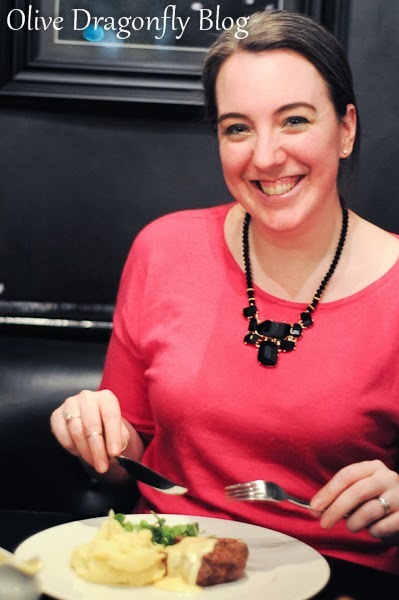 I've met Bex from Olive Dragonfly at a few different events and she's just as sweet as she comes across on her blog. You'll recognize her as a regular What I Wore Wednesday linker and a lover of accessories! 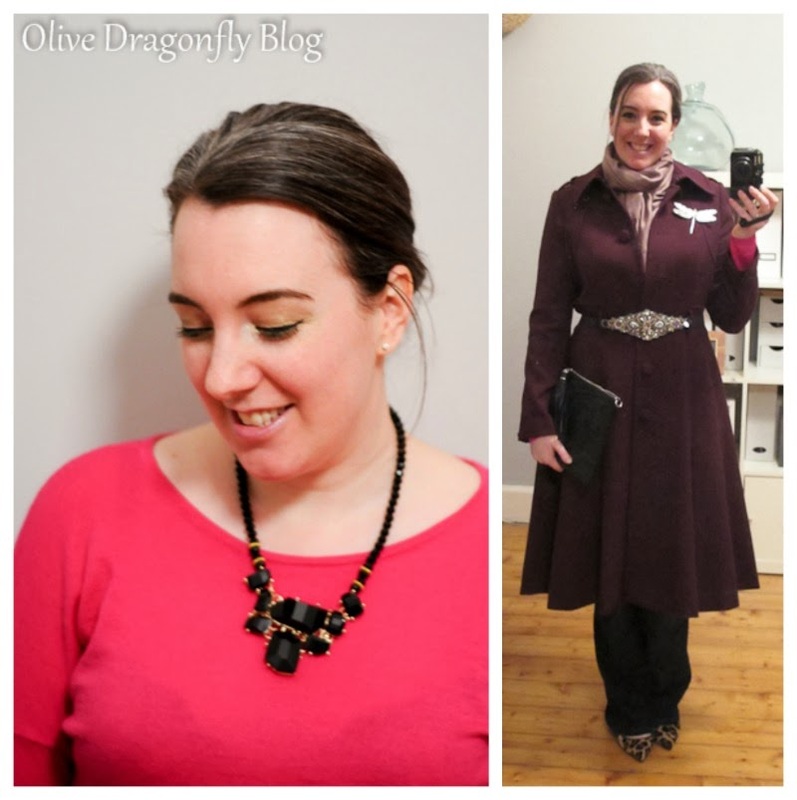 I had a great night out at Grill on the Corner recently with some fellow Glasgow bloggers and I wore what turned out to be a selection of sale garments! My bright pink cheerful jumper was just £7 from the GAP sale a couple of years ago, the black statement necklace is from Argento a couple of weeks ago. The leopard print shoes were from Nine West in the Debenhams' summer sale and I've been waiting for warmer weather to wear them but in the end couldn't wait and settled for dry weather! Even my scarf and belt were from the Accessorize sale and the Jasper Conran coat was bought during one of Debenhams' 25% off designers offers. Only my bag and brooch were full price and both still bargains :) The bag was £14.99 from HM and the pewter dragonfly brooch was £16 from Lady Crow Silks at a Christmas Fayre. I had a brilliant night with the girls and really enjoyed my steak with blue cheese sauce! As you can probably tell, I'm a bit obsessed with accessories, especially big, statement ones! Are any of you partial to a statement necklace or jewelled belt? Love that black necklace - so pretty! Love that belt! So pretty! I'm not a huge fan if belts but I love statement necklaces! Such a cute belt! Love how it defines the jacket! Thank you for hosting..and nice to meet you Bex. Great to see you lovely ladies.....dropping by your fun linkup Melania! I'm all about big statement pieces too! By the way, you have a beautiful smile...made me smile while I was reading! what a fabulous coat, the belt with it is gorgeous! I love them all but tend to wear necklaces more. 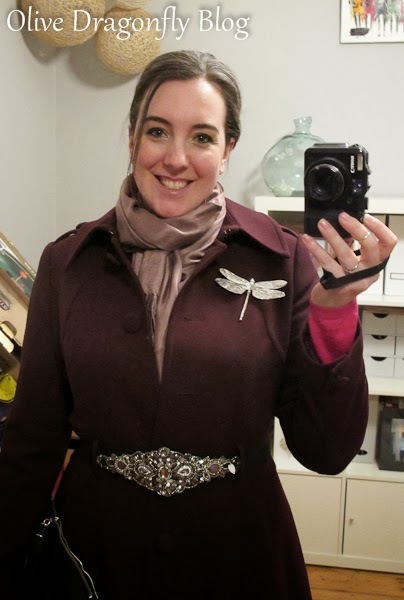 Great to meet you Bex - love that belt over the coat & the dragonfly pin is so pretty. LOVE that dragonfly brooch, Bex! I love statement pieces! Your belt is gorgeous! Wow, feel so honoured to be gracing these Transatlantic pages :) Thanks for having me and for all the lovely comments below! Thanks Rachel, I'm so glad I bought that belt! Gorgeous outfit. I do love a statement necklace too! I totally love your outfit. Your coat is beautiful and the addition of the dragonfly is just gorgeous. This is my first visit to WIWW, and I love it, so many fab blogs. That belt is STUNNING, what great style! Thank you for hosting the link up so glad I could be a part! LUXURY GIVEAWAY for a $245 pair of earrings from the Paris brand Satellite. Please stop by and enter!! Love the Dragonfly pin!! SO gorgeous! i'm loving the dragon fly pin! so cute. I definitely share your love of accessories--the bigger the better! I really love your coat!